A dirty, disorganized bedroom creates a welcoming atmosphere -- for more than one type of critter. 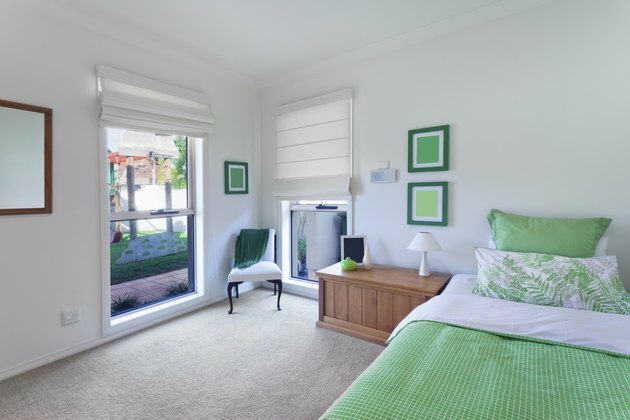 As for cleaning, the bedroom is often the easiest space to overlook; you can simply close the door and forget about it. But forgetting about it leads to consequences in addition to the germ or bacteria type. The longer you wait, the more the dirt and clutter accumulate. Discover a few reasons why it's important to keep your bedroom clean, and how easy it can be to achieve and maintain a spot-free and orderly space. The fewer dust-collecting pieces in a space, the less dusting you'll have to do. Even if you don't realize it, a dirty or disorganized bedroom can affect your mood negatively, even causing depression, explains psychologist Sherrie Bourg Carter in "Psychology Today." Eating right and exercising regularly keeps your body in optimal shape, but you're shortchanging yourself if you ignore your mind and soul health. Your bedroom is your personal space. It's where you drift off, wake up and likely spend a lot of "me" time. Unlike a cluttered space, an uncluttered room won't overstimulate your senses, distract you, make relaxation difficult or trigger guilt for letting things get out of control, says Carter. So beat the mess to help you beat or avoid the blues. When you sort, organize and neatly store the bedroom's overflow, you create an orderly space that's welcoming and where things are easy to find. But before you stock up on under-bed bins, shelving units and good-looking baskets to set on bookshelves and in the closet -- purge. That way, you'll have less to deal with now and later, and less is best when cleaning isn't your forte or time isn't your luxury. Chances are, you don't want or need your entire 1990s shoe collection, stack of dusty old books, or pile of worn handbags, out-of-style ties or "shrunken" belts, anyhow. If you suffer from allergies, cleaning your room can help. A few things that collect or multiply in seldom-cleaned rooms include dust mites, mold, pet dander and numerous other allergy-triggering bad guys. They thrive in soft fabrics, including carpeting, bed linens, drapery and pillows -- the bedroom's typical ensemble. Wash the bedding, vacuum and dust weekly. This reduces allergens, sneezing and itchy, watery eyes, which can help you to sleep better and generally improve your day. Make the room less dust-friendly by swapping carpeting for hardwood or laminate flooring, and curtains for blinds or shades. A clean, tidy bedroom might lead to decorating inspiration, and a well-decorated bedroom can lead to even more pride in the space. If your recently neatened and organized room has you longing for more style, start with cool color. Paint hides any lingering wall stains or discoloration, and the right hue -- such as pale, icy blue or cool green -- creates a calming atmosphere. Pure white accents, from candles and throw pillows to floral arrangements and picture frames, create contrast against faintly colored walls, and boost the overall look of cleanliness.